I recently put an old newspaper cutting of Peter Mathieson having been wounded during the war. On Sunday it was my pleasure and honour to visit Patty in his home where he described the moment when he was shot and how the bullet is still in his ribcage!!. What a man and he is and now 89 years old likes a dram and smokes like a train!!. He explained how he was a corporal with eight men awaiting orders in an area that was regarded as safe, when they were fired on. Patty was hit but gave the men orders to mount a Bren gun and as he said "lit them have it". My generation owe the likes of Patty so much, the old photo he thought would have been taken when he was 19 years old around 1942. I have also had the immense privilege to have met Patty in his home. A few years ago now, but an unforgettable visit. On three different occasions Patty's Mother had to endure the delivery of the dreaded Army Form b. 104-81, informing her that he had been wounded. 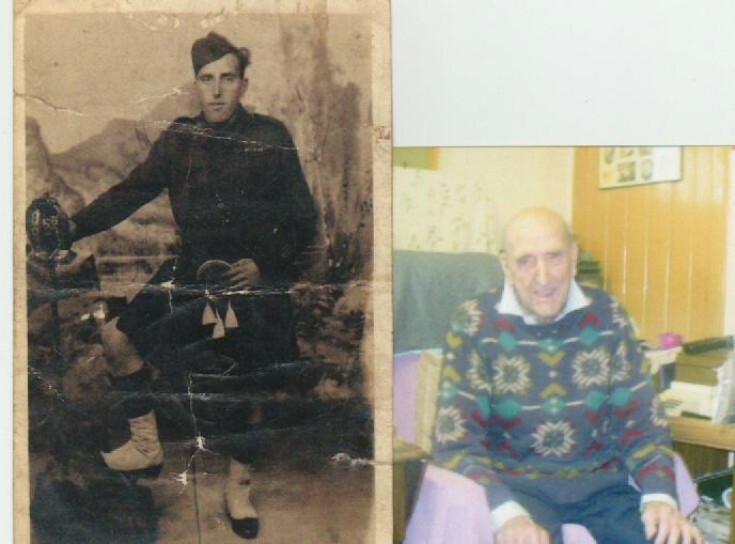 I was proud to tell him that my Father and two Uncles served in the 5th Seaforths.Unlike the other Seaforth Battalions they wore the Wildcat cap badge,"Sans Peur"(Without Fear)motto.The tartan, when worn, was a variety of Sutherland, of which there are a few,and was not unlike the Government Tartan. My Father was 20 years old when he joined in 1939,and was not discharged until 1946.